The activities of the AKWA Group are implemented through its five main operating divisions: Fuels and Lubricants; Gas; Fluids; Development; Real Estate. The Fuels and Lubricants division is involved in all aspects and levels of the fuels and lubricants distribution chain (from the import, logistics and transportation to the distribution infrastructure). Afriquia SMDC, one of the main subsidiaries of the group, has managed to penetrate the industrial, aviation and deep-sea fishing sectors and has among its clients the largest national public and private companies. Possessing one of the largest security reserves of the Kingdom, the company can cope with any special requests. The LPG division covers all the key levels of the gas distribution chain, from the manufacturing and filling of cylinders to the distribution of LPG (Liquefied Petroleum Gas). Through its subsidiary Afriquia Gas, the division has the largest storage capacity among the country's gas companies. Moreover, it holds more than 46% of the market share in the distribution of LPG. Oxygen, nitrogen, hydrogen, argon and rare gases are the core business of the Fluids division. 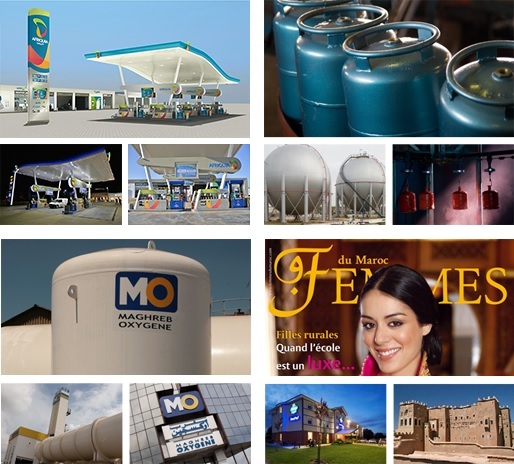 From these gases, Maghreb Oxygene, flagship subsidiary of the pole, which was founded in 1977, has been continuously reinventing its business, anticipating the needs of current and future markets. Through Maghreb Oxygene, the division deploys proactive strategies on research of gas production opportunities "on-site", market segment where the group is a leader, promoting innovative applications of industrial gases and supporting the health sector modernisation. In terms of industrial gas applications, the cluster seeks to establish a technical and commercial partnership with an international operator for the transfer of know-how. From the 1990s, the creation of the Development division demonstrates the will of the Akwa Group to diversify its activities in businesses with high potential for development, such as the press. Thus, the Group publishes prestigious journals such as Femmes du Maroc, Nissaa Min Al Maghrib, Maisons du Maroc, Nejma, etc. P-MET High - Tech Co. Pvt. Ltd.